Celebrate Special Occasions with Charm It Bracelet Charms! The CHARM IT! charm bracelet is a gift that keeps on giving with the wide selection of charms that are offered to accompany it. Whether you’re recognizing an achievement or celebrating a special event, there’s a charm for every occasion! Birthday Charms: Celebrate turning another year older by giving the birthday girl one of these CHARM IT! birthday charms! There are ice cream, cupcake, and confetti cake charms for the girl with a sweet tooth, or “happy birthday” balloon and locket charms to commemorate her special party. Sports and Hobbies Charms: Recognize achievements with a sports or hobby charm! Celebrate the end of a successful season with a basketball, cheerleading, soccer, or other athletic charm. Is she a pianist, actor, or dancer? There are charms for those hobbies and more as well! Scholastic Achievement Charms: Applaud her achievements from the school year or celebrate a hard-earned A with a scholastic charm! The Bookworm charm is perfect for a great report card, and the One Smart Cookie charm can be presented to her after winning an academic competition such as a spelling bee or science fair. “Just Because” Charms: Sometimes you don’t need an occasion to give a special gift! Choose from food charms, flower charms, princess charms, and more to surprise her with a CHARM IT! charm “just because.” The Daddy’s Girl, Mommy’s Girl, and sister charms make a great gift idea any day of the year! Do you know a special girl who wears a Charm It bracelet? 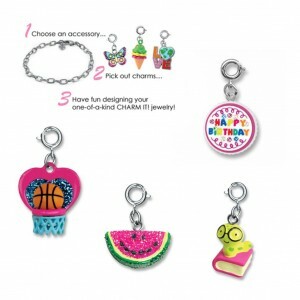 Find a wide selection of charms for her at CoppinsGifts.com! Celebrate Her First 12 Years with the Disney Birthday Figures Princess Train! 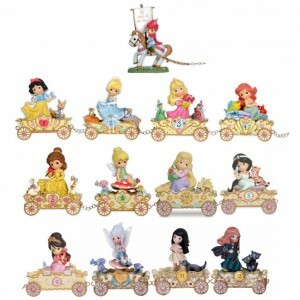 Precious Moments figurines have been given to commemorate significant occasions for over three decades, and you can celebrate a special little girl’s first 12 birthdays with the Princess Birthday Train collection! Birthday Train Prince: As a “welcome to the world” gift for her nursery, the birthday train prince leads the way for the 12 princesses. Snow White, Age 1: Celebrate her first birthday with the first princess to appear in a full-length Disney movie, Snow White. Cinderella, Age 2: The princess who perseveres to make all of her dreams come true will also help your 2-year-old’s birthday wishes come true. Aurora, Age 3: Wake your special girl up on her third birthday with the famous sleeping princess, Aurora. Ariel, Age 4: Ariel is the next passenger on the train to make the birthday girl’s fourth year a splash. Belle, Age 5: Belle, the princess known for not conforming, will encourage your 5-year-old to be her beautiful, unique self. Tinkerbell, Age 6: While she isn’t a princess, no Disney birthday figure collection is complete without Tinkerbell’s fairy dust to make it even more magical. Rapunzel, Age 7: Rapunzel is portrayed brushing her long blonde hair so that she looks picture-perfect for your little girl’s seventh birthday. Jasmine, Age 8: Present your spirited 8-year-old with Jasmine, the princess determined to live and love on her own terms. Mulan, Age 9: Celebrate the birthday girl’s last single-digit year with the heroic princess Mulan. Periwinkle, Age 10: A group of princesses needs fairy friends to keep things magical, so Periwinkle is along for the ride for the big tenth birthday. Pocahontas, Age 11: Remind her to listen to her heart with this year’s birthday princess, Pocahontas. Merida, Age 12: As her final princess, Merida will give your special girl confidence and courage as she approaches her teenage years. These Disney birthday figures are the perfect way to celebrate your princess’s first 12 years, and can be bought as a set or individually.